Huge Savings Item! 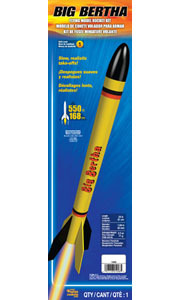 Save 16% on the Estes 1948 Big Bertha Flying Model Rocket Kit by Estes at Enria Industries. MPN: 1948. Hurry! Limited time offer. Offer valid only while supplies last. The Big Bertha is an Estes classic from the Skill Level 1 Series. In just one afternoon you’ll be ready for an exciting time at the launch field! 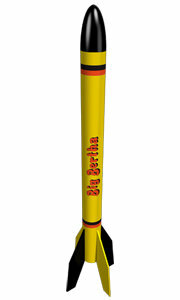 The Big Bertha is an Estes classic from the Skill Level 1 Series. In just one afternoon you’ll be ready for an exciting time at the launch field! Propelled by powerful standard Estes engines, this beauty travels to 500 feet. If you've never flown a Bertha, get one and launch it. Once you've flown it, you'll take it to every launch! Rocketeers aged 10 and up can enjoy high-altitude thrills, with adult supervision for children under 12. Big, burly, black and beautiful perfectly describes this Estes classic. The Big Bertha checks in at an impressive 2 feet tall! Big Bertha is an Estes original. Big, burly, black and beautiful perfectly describes this classic. She's an all-around Estes favorite that has truly withstood the test of time. Over the decades, Big Bertha has been most modelers' first “big” build. While standing on its massive fins, this impressive rocket checks in at 2 feet tall, floating back to earth with a decorated 18 inch preassembled parachute. Adding to your growing fleet of Rockets? Check out another Estes favorite, the Der Red Max Skill Level 1 Model Rocket Kit. In addition to the excitement and entertainment it provides, rocketry also has significant educational value. Model rockets transform kids into amateur rocket scientists, encouraging them to think about how the rockets work. Rocket building teaches kids the basics of propulsion, flight, and aerodynamics, and can help foster an early interest in science and engineering. Some painting, gluing and sanding are required for the Big Bertha. Quality Estes body tubes, laser cut wood fins, molded plastic nose cone and easy to apply self-stick decals make for an afternoon of building enjoyment with this Skill Level 1 kit. The Big Bertha requires an Estes Launch System and Estes engines for the launch (not included). Start with a B4-2, B4-4, B6-2 or B6-4 engine for the first flight. Use an Estes C6-5 engine for subsequent flights. Unless otherwise specified, all models require assembly. Tools, construction and finishing supplies sold separately. In order to launch, a launch system, model rocket engines, igniters, recovery wadding and four 'AA' alkaline batteries are required – sold separately unless otherwise specified. Read all instructions before beginning. Make sure you have all parts and supplies required. Test fit all parts before applying glue. Sand as necessary for precision assembly. Product color and shape may vary. When launching, stand back as far as the launch controller cord will allow (15 feet). Rocketry is not intended for indoor use. Choose a large field (500 feet), free of dry weeds and brown grass. Launch only with little or no wind and good visibility. Estes body tubes, laser cut wood fins, molded plastic nose cone, self-stick decals, 18 inch preassembled parachute and instructions. Requires some painting, gluing and sanding for the end result of hours of fun! If you have any questions about this product by Estes, contact us by completing and submitting the form below. If you are looking for a specif part number, please include it with your message.